The foreign exchange (FOREX) market used to be the exclusive arena for professional currency traders and major financial institutions. With the barriers to this market now removed, you too can participate and profit from currency trading–but first you must learn how. In Currency Trading: How to Access and Trade the World's Biggest Market, expert trading veteran Philip Gotthelf provides a cutting–edge and comprehensive overview of the largest market in the world–where currency trading volume exceeds $1 trillion daily–and shows you how to take advantage of the fluctuations within currency markets to reap enormous rewards. The dynamics and rules of currency trading are constantly changing. There is no point in following the outdated advice of "experts." 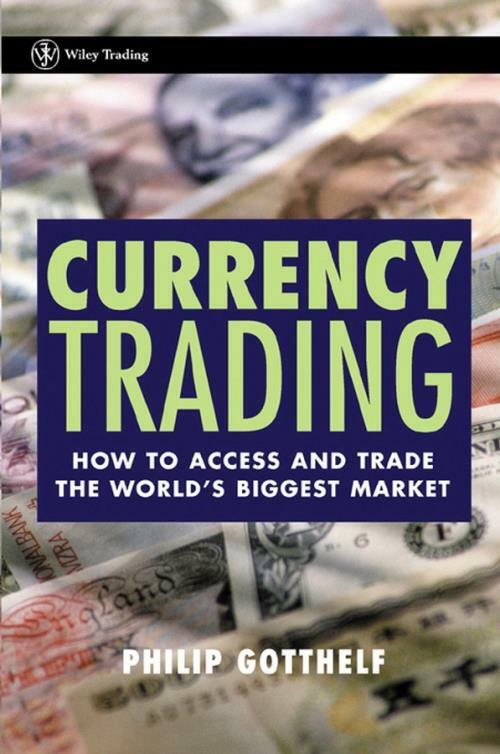 Currency Trading offers practical information which will allow you to cultivate your own views of currency trading, sharpen your skills, and ultimately, draw your own conclusions on where, when, and how to trade almost any currency–from U.S. Dollars to Euros. Chapter 1. Money, Currency, and Foreign Exchange (Forex). Chapter 3. The Wealth of Nations. Chapter 4. The Shifting Sands of Fundamental Analysis. Chapter 5. Interventions, Scams, Rouges, and Manipulations. Chapter 6. Understanding the Markets of Cash, Futures, and Options. Chapter 7. Practical Trading Strategies. PHILIP GOTTHELF publishes the Commodex(r) System, the longest–standing daily futures trading system in the world, and Commodity Futures Forecast(r) Service. He is also President of Equidex Inc., a registered Commodity Trading Advisor, and President/CEO of EQUIDEX Brokerage Group, Inc., (a registered Introducing Brokerage firm). His writings frequently appear in major industry publications including Futures magazine, Technical Analysis of Stocks & Commodities, Top Farmer, Pro Producer, Barron's, and Energy in the News. He is regularly quoted in The Wall Street Journal, the New York Times, Fortune, Forbes, U.S. News & World Report, Barron's, and Money, and has acted as consultant to major financial and consumer publications. Gotthelf is a regular guest on CNBC, MSNBC, and CNN. He is also the author of two previous books: TechnoFundamental Trading and The New Precious Metals Market.